I’ve got a fun giveaway for you today from Land’O Lakes butter. 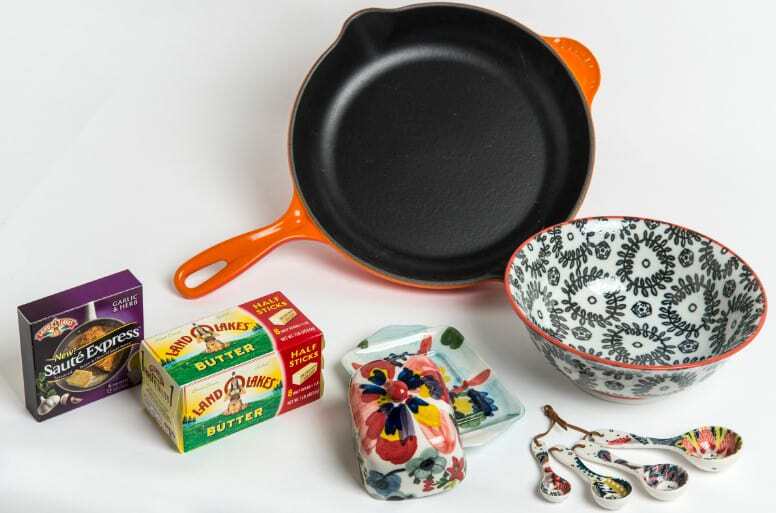 The giveaway pack includes lots of goodies plus a Le Creuset cast iron skillet in their signature flame color. I’ve recently become a Le Creuset cast iron skillet convert. I can’t tell you how much I love them, even more than Granny;s old perfectly seasoned skillets that I have. These Le Creuset skillets are not only much easier to clean and maintain, because you don’t have to watch out for rust and oil them constantly, but I could swear they even cook better. Also included in this giveaway is the cutest half stick butter dish. I’ve been on the lookout for a cute butter dish forever, and now finally have one. And on top of it being super cute, it holds my favorite half stick butter from Land O’ Lakes And if you use a different brand, just wrap up the rest of your butter to keep it fresher longer. There’s a really cute little bowl and adorable measuring spoons in this giveaway pack too, along with some coupons for Land O’ Lakes new Saute Express. This giveaway set was provided by Land O’ Lakes. I also rec the same set, but no other compensation. All opinions 100% mine. $100 Question, What’s your favorite way to enjoy whipped Cream?